Use soft spotlights to light up favorite shrubs, trees, and other plants in your garden. Using the proper garden lighting on certain plants will bring out their colors in the night, making your landscaping look vibrant. 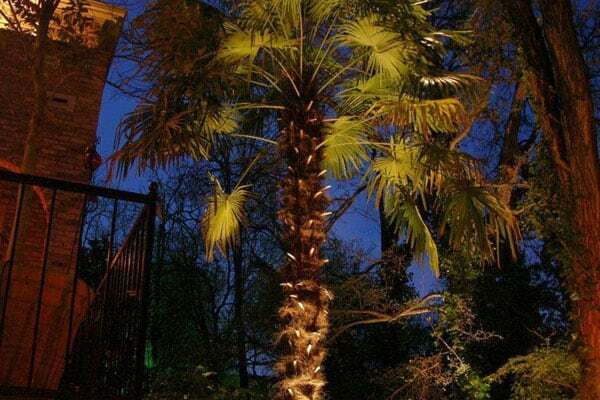 If you uplight trees that are near a wall, the lights will cause the trees to casts dramatic shadows, further enhancing your landscape. If you have plants, statues, or even pots alongside a wall, use wall lighting to shine down on the featured objects. A soft garden light that directs light up and down at the same time not only highlights the object under the light but also creates an area of light that reaches up the wall. Add statues of birds or other wildlife to your garden that might cast a good shadow. Place them next to a wall or a fence and then light them up with a spotlight. When the lights are placed correctly, they will cause the statues to cast shadows on the background fence or wall. Be sure to choose items that will cast an easily-recognizable shadow. Highlight water features that are installed in your garden with regular or colored outdoor lights. If you have a fountain, you can install a light underneath to make it stand out at nighttime or colored lights to add extra beauty and dimension at any time of the day. For a fish pond, soft lights can be used to create a ring of light around the edge of the pond or highlight water plants at one end of the pond. Creative Nightscapes understands how important it is to make your home’s garden look its best. Whatever look you’re going for, Creative Nightscapes will be able to help you make it happen. They’ll design the perfect outdoor lighting to compliment your garden and any other parts of your landscaping that you want highlighted. Give us a call today.